>> Water Proof Material Is Made Of Two Plastic Faces With Hollow Flutes In Between To Add Strength & Rigidness. Made Of A Titanium Bi-Product Making It 6 Times More Wind Resilient Than H-Wires. It Takes 2 Beefy Stakes To Hold Up Signs Up To 24". For Signs Wider Than 24" We Recommend Three Beefy Stakes. 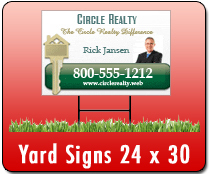 Made Of 9 Guage Galvanized Steel & Will Keep Your Sign 14" Off The Ground. Recommended For One Time Used Only The Bottom Rung On This On This H-Wire Is For Stability But Can Assist In Inserting Stake Into The Ground.